Story and photos by George Sass Sr. In the July issue, I wrote about our decision to downsize from the custom 43-foot Down East-style boat that has taken us safely and comfortably more than 12,000 miles during the last 10 years. We wanted something that would simplify our lives and allow us to continue cruising on a reduced budget as we slowly make the transition to retirement. After months of looking at and testing boats from 25 to 29 feet, we decided to buy a C-Dory TomCat 255 power catamaran. A summer of cruising on ViewFinder has taught us some surprising lessons about cruising on small boats. High quality and seaworthiness were primary qualifications, but we also were looking for good value. Accordingly, we looked at used and factory-new models. 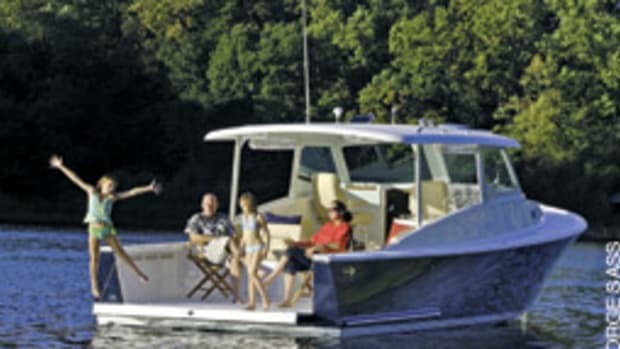 Because the boat market was weak, we found something in between — a “brand new” 2009 dealer demo that was priced right. Our decision was guided by our overall desire to keep things simple. 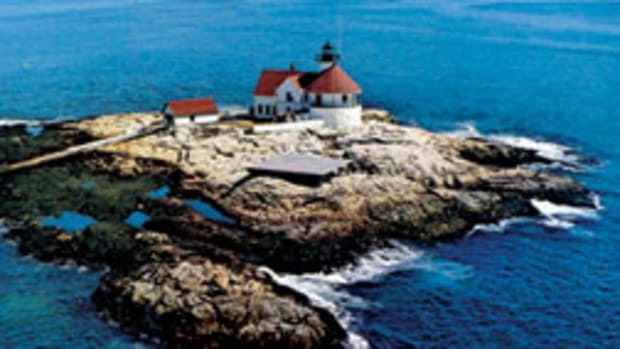 Although our previous boats — a 26-foot Folkboat, a 37-foot Dickerson Ketch, a Grand Banks 42, an Eastbay 38 and a Thomas Point 43 — were never considered floating condos, we nevertheless wanted something even simpler that would minimize day-to-day care and maintenance, and maximize our time on the water. We began our search with a short list of nine small boats (see “Thinking smaller,” July), and after a number of sea trials the first thing we concluded is that we wanted outboards. I found that engine access is fair, at best, on most small diesel-powered boats, and noise and vibration are more difficult to attenuate than on larger boats. On the contrary, the newest 4-stroke outboards, typically far aft, are amazingly quiet, even at cruising speeds, and they create virtually no vibration throughout the boat. At idle speed it’s hard to tell whether they’re even running. 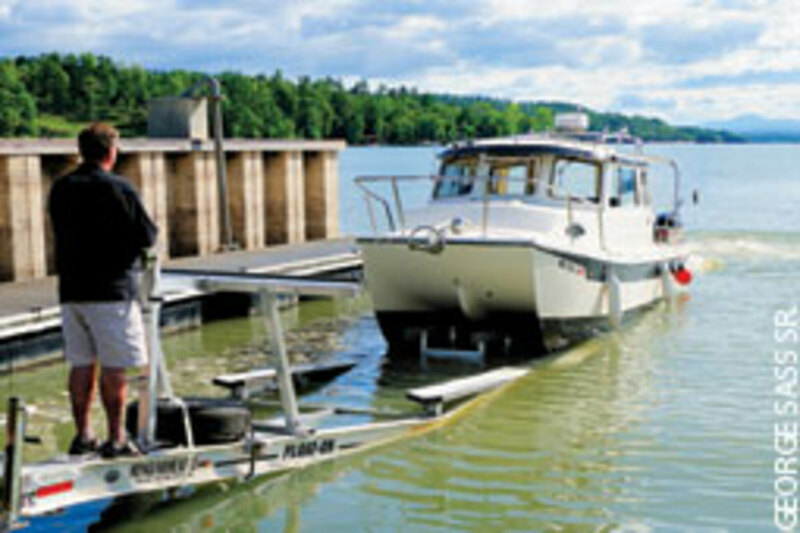 A diesel also takes up room that can otherwise be used for storage, a premium on small boats. The idea of being able to raise the outboards to reduce draft and tuck into more shallow, protected anchorages was also attractive to us, and because of the boat’s smaller size we would be able to beach the boat in certain situations. An additional advantage to the outboard-powered boats we looked at is that they are typically set up as twin-engine installations. On the other hand, the diesel-powered boats we were considering are single-engine models only and, after 25 years of cruising to out-of-the-way places, we are convinced that two engines are simply better than one. By process of elimination, our short list now consisted of four outboard boats. Although we love the aesthetics, performance and quality of the Maine-built Padebco 27, the cost of a new one meant that we would have to wait until our 43-footer sold. In this slow brokerage market, that would mean missing a boating season. There were no used Padebco outboard models available. Also on our list was the salty-looking, nicely appointed Canadian-built Caledon 27, but there are no dealers. We would have had to travel to Ontario to see one under construction and there were few, if any, used ones available. 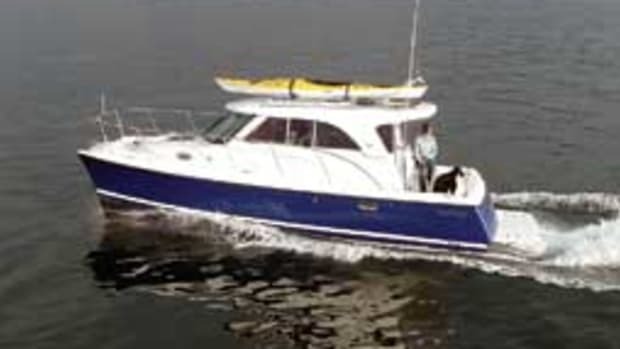 This narrowed our selection to the popular Rosborough 246 and the C-Dory TomCat 255, both of which we were able to sea-trial and spend time aboard. We like both boats, so it was a close call. We primarily decided on the TomCat for two reasons: We preferred the interior layout, with its queen-size forward berth and, most of all, its enclosed head with shower, and the concept of a multihull was intriguing. We were going to have to get used to a smaller boat’s motion, especially at rest, and we found the cat’s static stability to be superior to that of a monohull of comparable size. Standing on the TomCat’s gunwale while getting on and off the dock hardly tips the boat at all. The same characteristic makes it stable while anchored. It doesn’t take much to get small boats rolling from gunwale to gunwale in a rough anchorage or when an inconsiderate boater blasts by, but the TomCat remains relatively flat in these conditions. The recession hit boatbuilders hard, and the C-Dory brand suffered along with the rest. Although it’s back on its feet and building boats under the ownership of Triton Marine Industries (www.tritonmarine industries.com), C-Dory’s two previous dealers for the Chesapeake Bay area no longer represent the brand. 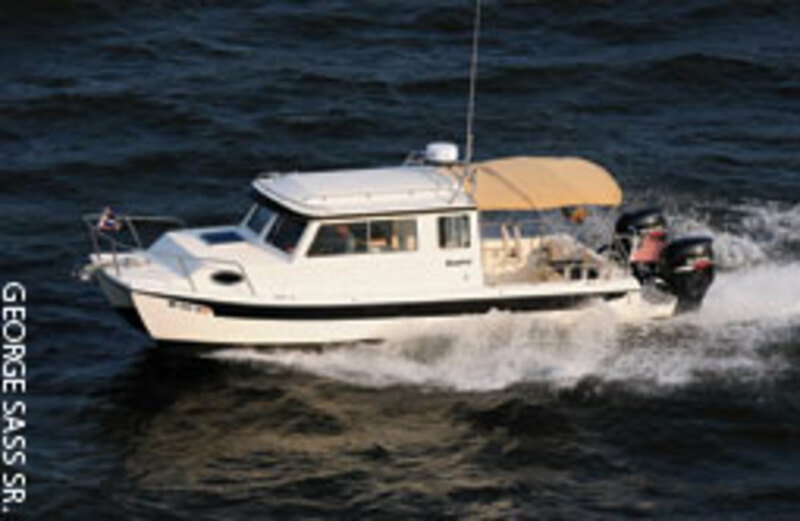 Online research, however, showed that Wefing’s Marine (www.wefings.com) in Apalachicola, Fla., was not only a dealer, but it also had a 2009 TomCat demo with twin Suzuki 150s and a custom Float-On trailer in stock. Located on the Gulf Coast, Wefing’s was severely affected by the Gulf oil spill and was still trying to move its remaining 2009-10 inventory. 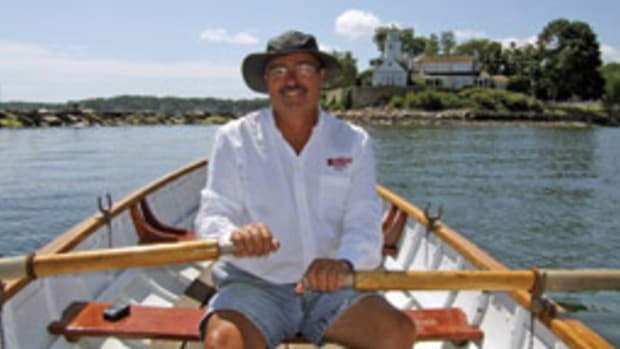 A number of conversations with part-owner Marc Grove convinced me that he had a wealth of knowledge about C-Dory boats and was an expert on trailerable cruising boats. He is also a dealer for the popular Ranger Tugs. 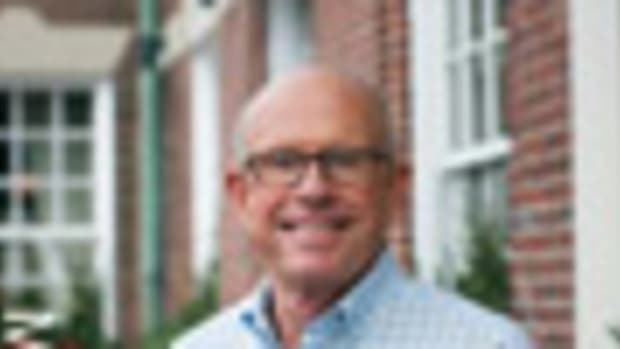 My online research also led me to the C-Dory owners website (www.c-brats.com), which is one of the most informative and active owner sites in the boating community. In a matter of hours I had a good idea about the pros and cons of the TomCat, all from the valuable perspective of other owners. After reading what many had to say about their boats — monohull models and the TomCat — I was becoming hooked. I flew down to meet Grove and see the TomCat, and I liked what I saw and heard. This particular TomCat had a higher level of interior finish than the ones I had previously seen. It sported classy teak trim, an attractive headliner and nicely finished cabin sides. Previous production had a rough, unfinished look, with exposed fiberglass and wiring. Thankfully, Triton is building the boat to this higher standard of finish. After a sea trial that allowed Marc to show off the TomCat’s top speed of 40 knots, its ability to turn at high speeds without leaning and its overall stability, we came to an agreement about the price and how I wanted the boat set up and commissioned. Wefing’s works with Richey Boat & Motor (www.richeyboat.com) in Hudson, Fla., for final commissioning, so I returned in a month to review the progress. I had the batteries upgraded, a barrier coat and bottom paint applied, and a complete Garmin electronics package installed. For more accurate engine monitoring, all of the analog Suzuki gauges were replaced with three of Suzuki’s multifunction digital units. A new teak dash was created to match the rest of the boat’s trim, adding to the little boat’s yachty look. Marc towed the boat to Annapolis in early May, and my wife, Stacey, and I spent the next couple of weeks outfitting it, taking day trips and overnighters while adjusting to a much smaller boat than we were used to. The real test of the decision to downsize to this extent and, in particular, whether the TomCat was the right choice came during our two-week summer cruise on Lake Champlain. We contracted with Matt Jabin’s A&B Marine Trucking of Edgewater, Md., (www.abmarinetruckinginc.com) to pick up our trailer, load the TomCat and deliver it to New York’s Westport Marina on Lake Champlain. Jabin used his Ford F350 “dually” to tow the nearly 10,000-pound package. It took just an hour to prepare the boat for the road trip, and we drove up a couple of days later and found our boat in its slip, waiting for us. The cost for this door-to-door, or slip-to-slip, service was $3 a mile, $1,500 for the 500-mile one-way trip. 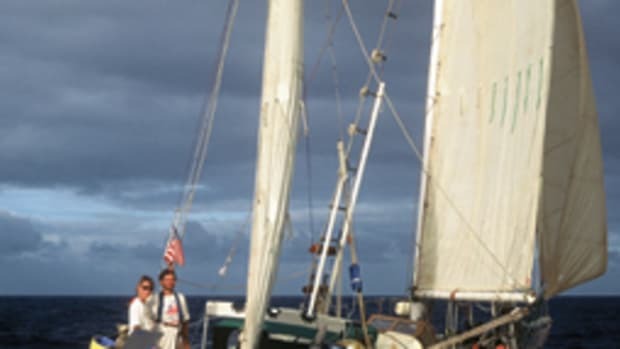 We compared that with running the boat to Lake Champlain on its own bottom, which would take about a week and incur the cost of fuel, overnight slip fees and restaurants, not to mention wear and tear on the engines. The out-of-pocket costs were nearly the same. The savings in time and wear and tear were substantial. We spent the next two weeks exploring Lake Champlain, running back and forth between New York and Vermont, staying in marinas half the time and on the hook the other half. Although the TomCat is only 26 feet (not counting the outboard bracket, outboards and anchor roller) it has tons of storage space. We packed enough dry goods and clothing for the two-week cruise, and between the built-in refrigerator and our Igloo cooler we only occasionally visited a convenience store to replenish our supply of fresh food. We found the queen-sized berth to be comfortable for the two of us, even with Schooner, our 55-pound dog, sleeping at our feet. For hot showers after two days on the hook (outboards do not heat water like a diesel), we used a simple sun shower tied to the roof, with its spray nozzle leading into the cockpit. To get to shore when anchored we used our Aries inflatable kayaks, which we stowed on top of the pilothouse. We love the lightness of these kayaks and they are stable enough to take Schooner with us. The TomCat’s shoal draft of just 2 feet with the engines tilted up allowed us to anchor close to shore, away from the crowds and protected from wind and choppy seas. Surprisingly, the cockpit of the TomCat is not much smaller than that of our 43-footer, so we didn’t give up one of our favorite things to do — sitting under the shade of the Bimini and watching the outdoor world go by. Not only do the twin engines make it easy to get into a tight slip, but the boat’s 7,500-pound displacement also makes it possible for either of us to fend off with a boat hook. Docking this boat is so easy that we laughed as we came alongside one tricky dock. Seated at the helm, I reached out my window, put out a fender and looped a spring line around a piling. We also came to appreciate the TomCat’s single level. There is no going below on this boat, as everything from the cockpit to the forward berth is on the same level. And although some may wonder how we could adjust to such a small living space, we found it fun and amusing. I can sit at the dinette while eating a sandwich with one hand and reach with the other to open the fridge for another cold brewskie. Bottle opener? Oh, yeah, that’s in the galley drawer right across from me. No need to get up. 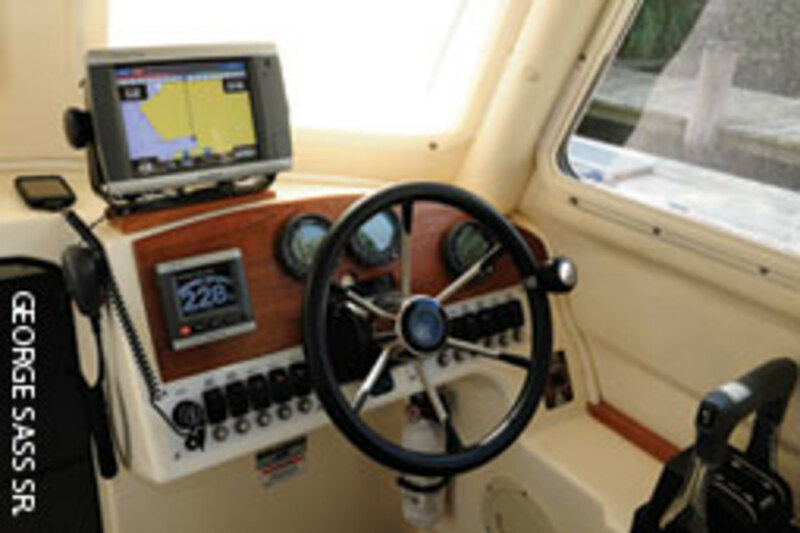 Navigating is easier than ever, too, thanks to Garmin’s incredibly user-friendly interface and touch-screen technology. I’m used to far more complex electronics on oceangoing yachts and have always had to deal with painful learning curves — in some cases just trying to turn the darned stuff on. It wasn’t often that I needed to refer to Garmin’s instruction manual, but when I did I enjoyed the easy-to-understand text and attractive, illustrative graphics (www.garmin.com). Compared with cruising on our larger boat, we were less hesitant to spend nights at a marina. The cost for a slip was 40 percent lower and we appreciated the use of the shower and head facilities. And with our smaller size and draft, we never had a problem getting a slip, even without a reservation. One crowded marina simply put us on its dinghy dock, conveniently within a few steps of its Tiki bar. 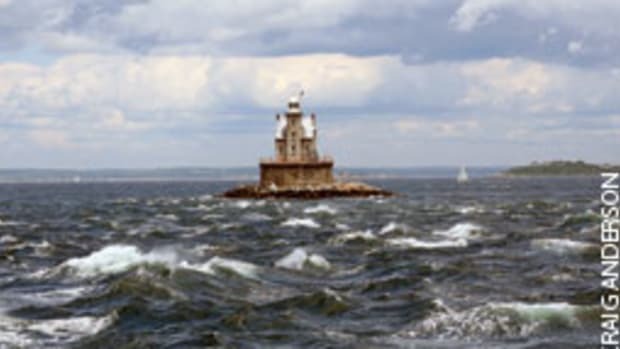 Of course, there are huge differences between small and large boats when it comes to running in rough seas, and it is in this area that we’ve had to make our biggest adjustment. Our 43-footer can get up on plane and at 16 knots shoulder her way through a 3- to 4-foot chop without hesitation. We’ve run inlets while following the crests of 8-footers. And we’ve battled our way to protected harbors at displacement speeds in 10-foot seas. We quickly learned that we wouldn’t want to be out in our 26-footer in these conditions. Put simply, paying attention to sea conditions is much more critical when you’re in a small boat, and we’ve now found ourselves waiting for weather to improve before venturing out. But the speed of the TomCat can partly compensate for this limitation. In less than 3-foot seas, we can now cruise at 20 to 25 knots. We often found ourselves ahead of schedule, getting to an anchorage or marina well before we had planned and before others. So even if we experienced a bad weather lay day or two, we still covered all of the ground we wanted to. Like all boats, the TomCat has its faults. Because of the blunt forward section between the two hulls, heading directly into a small chop creates banging and slamming, even at slow speeds. We’ve learned to fall off a few degrees and “tack” into head seas. Also, the aft end of the tunnel section between the two hulls is actually in the water at slow speeds, and waves become trapped inside this space. This can cause quite a bit of noise, even when at anchor — a reason for tucking in close to shore. At about 18 knots, however, the TomCat’s tunnel section rises and begins to ride on a cushion of air, and the twin hulls get up and over the chop. The faster it goes, the greater the cushion, and as long as the angle of attack is not head-on, the boat performs beautifully. When things really got challenging and we faced 30 knots of head wind and 4-foot seas, we simply slowed to 6 knots and tacked upwind until we found a protected anchorage for the night. As long as we slowed, we never felt in danger, and we sensed that the boat could handle a lot worse, if necessary. After two weeks of exploring Lake Champlain we returned to Westport Marina, where Matt Jabin met us to deliver ViewFinder back to Annapolis. We were astounded to realize that we had put only 20 hours on our Suzukis but had seen everything we planned to see. Better yet, my biggest maintenance job during the entire two weeks was lifting the engine cowlings to check the oil level. I didn’t have to crawl into an engine room to check things and didn’t have to troubleshoot a systems problem. After 25 years of cruising together, Stacey says she has never seen me more relaxed. I guess I owe it all to keeping it small and simple. LifestylecatamaranPrint magazine December 2011C-Dory TomCat 255George Sass Sr.